Micromanagement is one of those deceptive business techniques that might appear productive, but that can really create a toxic business environment. It decreases management productivity. It frustrates employees. And it can hurt business revenue. A study of more than 7,000 employees found workers who felt a low level of empowerment had an engagement level at the 24th percentile, compared to employees with a high level of empowerment who had an engagement level at the 79th percentile. Engagement matters, because businesses with highly engaged teams outperform peers by nearly 150 percent in earnings per share, Gallup research reports. Employee empowerment is directly tied to results. 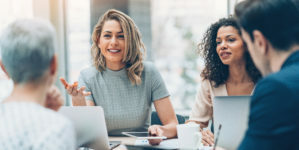 A study by Zenger Folkman found 4 percent of employees are willing to put in more effort when empowerment is low, while 67 percent are willing to go above and beyond when empowerment is high. So how do you empower your team to make decisions for your business? Here are five ways. Employees will feel empowered from the start of any project when you make the decision-making process collaborative. State a goal. Then ask questions to gain input on how to navigate the course to getting there. An early brainstorming session among team members clues employees in to effective paths to take. You may have a vision for how you want something executed, but your team members may have more creative and efficient ways to complete a task. Be open to new ways of doing things, since that is how your team will grow. Don’t discourage different opinions or ideas. Be blatant about your encouragement of “thinking outside the box,” so employees embrace innovative problem-solving and task completion. When employees are able to use their strengths at work, their confidence builds and they’ll feel more empowered. Gallup research shows employees who use their strengths daily are 8 percent more productive and 15 percent less likely to quit. When you’re delegating tasks within projects, do so based on employee strengths. Don’t assume you know all the strengths of your employees, though. Meet with each employee and ask them what they view their strengths as. You may discover ones you hadn’t considered before. A better understanding of your team helps you lead them more effectively. You can give them more opportunities to shine by empowering them to tackle tasks and projects suited to their strengths. Then, invest in training and development to help them improve their understanding of concepts where they’re lacking. When you let go of micromanaging and empower your team, honest mistakes are bound to happen. That’s OK. If mistakes happen, don’t punish employees. Make them teachable moments, with constructive feedback that helps employees understand what led to the mistake and how to avoid making it in the future. Don’t wait until an end-of-the-year banquet to bestow recognition. If you wait, your employee might have left your company by then because they were never recognized. Micromanagement is hovering and nitpicking and creates a culture of mistrust. You want to avoid specifying how every little detail of a project should be executed, but you also need to be available to your team. When you delegate, state the confidence you have in team members to execute, but also offer yourself as available to help with questions that come up. Some decisions within a project will be more significant than others. These may be ones that your empowered team members may still want to consult with you on. When questions come up, instead of providing your way of doing things, first ask the employee about their ideas. You can always advise to avoid doing something glaringly incorrect or that will cost your business in time and money, but try to encourage the employee where you can. Again, be proactive with positive feedback. Frequent feedback is especially important to millennial workers, Gallup research found, but only 15 percent of millennials agree they routinely ask for feedback. Provide feedback even when it’s not asked for. Set up regularly meetings with team members to check in. Enquire about progress, provide positive reinforcement and offer development and training for areas workers want to improve upon. If you want better performance from your team members, you need to walk the talk. Model positive behavior yourself. A Zenger Folkman analysis of 19,000 employees found high employee empowerment significantly correlates with a positive work environment. Make mentorship a priority. Create a culture where your team members feel respected and valued. Ask your employees about their career goals, then provide strengths-based tasks and training and development opportunities to help them get there. Mitigate conflict within a team by addressing it quickly. Get the parties who are involved together to identify a compromise they agree to. Have a positive attitude at work, and recognize employees who do the same. Want More Tips for Effective Leadership? Empowering your team is just one piece of the effective leadership puzzle. To learn how to lead across generations, download our free e-book, The Executive’s Guide to Leading Millennials, Gen Xers and Baby Boomers.